Based in the heart of rural Suffolk, Stokes aim to make the very best sauces you can buy. Their unique recipes are made in small batches using high quality ingredients and their glass jars and bottles are fully reusable, not just recyclable. Finding just the right extra virgin olive oil for Stokes Real Mayonnaise proved quite a challenge. Not any old EVOO would do. Oh no. After trying more than thirty different varieties, the good people at Stokes finally settled on Koroneiki extra virgin olive oil from Crete. Koroneiki olive trees produce an abundance of small olives which have some of the highest polyphenol content possible – just what you want to promote good health. When pressed they create an intense, rich green oil with a smooth and uniquely exquisite flavour. The Koroneiki olive trees are said to be particularly attractive with two tone leaves, both light and dark green. Similarly, green and purple olives can be seen on the same tree at the same time. If you’d like to see a real Creten Koroneiki olive grove for yourself, why not try and win a foodie trip to Greece? You’ll find details a little further down the post. I’ve been eating rather a lot of Stokes Real Mayonnaise in my sandwiches and with cheese and biscuits, but it also makes a great addition to my black chickpea & red quinoa burgers with prunes. Stokes tomato ketchup is made with juicy tomatoes from Italy with only a few other ingredients. I can honestly say it’s the best non-homemade version of tomato ketchup I’ve ever had. A dollop on top of jacket potatoes is surprisingly good I found. It also makes a useful cook’s ingredient for a variety of dishes. On the rare occasions we eat chips, CT is not happy unless there’s some mayonnaise to accompany it. He particularly likes to mix some with tomato ketchup and maybe a bit of chilli sauce too. All covered by these sumptuous sauces from Stokes. Brown sauce is a bit of a new concept to me. I’ve never bought a bottle in my life and didn’t really have much idea what it would taste like. Stokes brown sauce is a traditional one made with date puree and black treacle. It has a rather heady aroma and tastes rich and spicy with both savoury and sweet notes. I’m not quite sure how I will use it yet, but I suspect it would work well in my pulled jackfruit recipe. Many’s the time I’ve made my own chilli sauce. Sadly, we haven’t been able to grow chillies for the last few years, so my cupboards have become rather bare in this respect. I’m therefore very happy to have discovered Stokes sweet chilli sauce. It doesn’t taste too hot to begin with but the heat slowly builds until you’re rather wishing you hadn’t just taken a big spoonful. Being both hot and sweet, it’s a great way to liven up a tomato sauce. It works brilliantly as an addition to this Sicilian pasta salad. Sweet and sticky, this red onion marmalade is just fabulous with cheese and biscuits – and a little Stokes Real Mayonnaise of course. I’ve been meaning to have a go at making my own for years now and still haven’t managed it, so I was really pleased to get a couple of jars from Stokes. It’s a bit sweeter than I would make it, but a lovely accompaniment to the Christmas cheeseboard nonetheless, as well as being a wicked stocking filler. 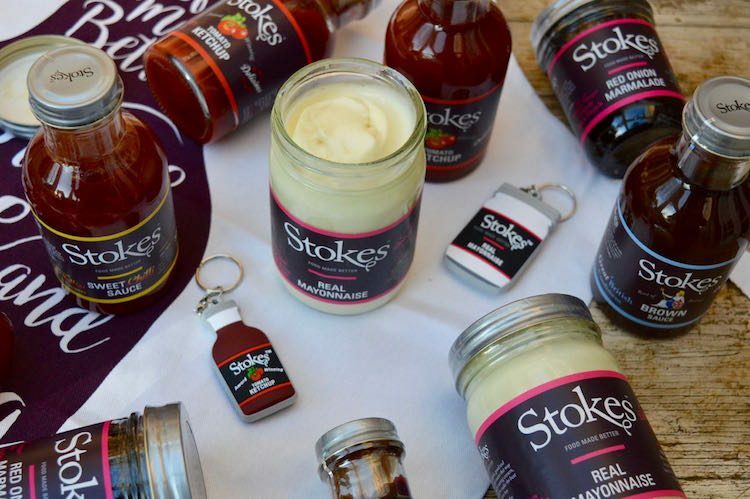 Stokes Real Mayonnaise and their other sumptuous sauces are available from Sainsbury’s, Waitrose, Ocado, Booths and many independent stores, farm shops and delis. Stokes are offering a three day trip for two foodies to Crete, including a personal guided tour of a koroneiki olive grove. There are also ten runners-up prizes of luxury Stokes hampers. For a chance to win this foodie trip for two to Greece head on over to the Stokes Real Mayonnaise site (T&Cs apply). Entry is easy. You’ll find the answer within this post. This post was commissioned by Stokes Sauces to spread the word about their sumptuous sauces and competition. I was not expected to write a positive review and all opinions are, as always, my own. Thanks to my readers for supporting the brands and organisations that help to keep Tin and Thyme blythe and blogging. I love discovering new pantry items like this. I will really have to give them a try! I’ve seen this brand from a few blogging buddies now! I haven’t seen it around my area, tho! Which of their products are vegan – just curious!? Thanks! Hi Jennifer. The products should be available in Sainsbury’s and Waitrose as well as some independents stores, farm shops and delis. None of the sauces I’ve mentioned here, with the exception of the mayonnaise contain any animal ingredients. You can always check out the ingredients of a specific sauce on their website to just make sure. One of my local Vegetarian Cafes has all of these sauces as their condiments. I’m not a fan of either red or brown (both my kids are) but I love a good Mayo. Pleased to see they use free range eggs. Now that sounds like one classy joint 😉 The mayo is really good and I even like their red and brown, which is very unusual for me. I have tried their tomato sauce and love it, need to try their other items too. Your burgers look lovely! It’s the only commercial tomato ketchup I’ve ever liked. I was super pleased with those burgers. I’ve never seen them anywhere, so good to see they are popping up in various places. I’ve never liked a commercial tomato ketchup before I had this one. Ooh definitely a must for Christmas leftovers. Good to know they are easy to get hold of.